The Chinese legend has it that the Jade Emperor once held a race for all the animals in his kingdom, and promised the first 12 animals to cross the stream will be named the animals of the zodiac. The pig was the 12th and last animal to cross the stream during the race, because it took a break halfway through the crossing to relax and eat. This year, we reach the end of yet another Lunar year cycle, as we celebrate the coming of the Year of the Pig. Said to be an animal associated with good fortune, success, wealth and resilience – defining characteristics said to be transferred to people born in those years (1935, 1947, 1959, 1971, 1983, 1995, 2007 and 2019), these watchmakers have crafted timepieces to honour the Year of the Pig, hoping to spread good fortune, success, wealth and resilience for the wearer. A watchmaking masterpiece that combines the fundamental principles of the age-old lunisolar calendar stemming from Chinese tradition, with the date according to the Gregorian calendar, the Blancpain Villeret Traditional Chinese Calendar is the perfect timepiece to feature the pig in celebrating the coming Chinese New Year. A complication that took five years of research and development, given that the basic unit of these two time-division systems is not the same, (the Gregorian calendar is based on the solar day, while the lunisolar Chinese calendar is based on the lunar cycle, consisting of 29,53059 days, roughly about 11 days shorter than a solar year), Blancpain has achieved a real technical feat. Upon the white Grand Feu enamel dial, the animal of the year – the pig, appears in a window at 12 o’clock; while the double hours counter below displays in numbers and symbols: the 10 celestial pillars and five elements at 3 o’clock, and two hands at 9 o’clock serve the month and the date, and the moon phases at 6 o’clock determines the months of the Chinese calendar. An aperture dedicated to the leap months complements the rim of the chapter ring by means of a blued steel serpentine hand, pointing out the date according to the Gregorian calendar. The refined and timeless aesthetics of the Villeret collection is issued in a 50-piece limited edition, featuring a white gold oscillating weight engraved with the Chinese zodiac sign of the year, as well as in an unlimited red gold version with a guilloché oscillating weight. During Baselworld 2018, Hublot expanded its catalogue of innovations with the first ceramic to be created in a vibrant colour. A 100% in-house feat that has taken the Manufacturer four years to develop from concept to industrialisation, the ceramic created is harder than previously seen (1500 HV1 versus 1200 HV2), resulting in a secret formula protected by several patents over at Hublot’s Research & Development department and Metallurgy and Materials laboratory. The Hublot Classic Fusion Chronograph Orlinski Red Ceramic is one of the first watches to carry Hublot’s patented red ceramic, evoking the world’s bestselling contemporary artist Richard Orlinski’s first Born Wild Crocodile sculpture –created in 2004 featuring the same vivid and powerful shade of red. Like Orlinski’s sculptures, the 200-piece limited edition 45mm Classic Fusion Chronograph Orlinski Ceramic boasts the sharp three-dimensional sculpted lines and polished finish, signature facets nuanced with angles and edges that are presented as words of art for the wrist. In continuation to Chopard’s precious L.U.C XP Urushi collection, which features one of the 12 signs of the zodiac each year, the ancestral Japanese art of Urushi is thus being called upon once again to create a watch marking the start of the traditional Chinese calendar’s Year of the Pig. The dial of the Chopard L.U.C XP Urushi Year of the Pig is entirely hand-crafted, using the traditional Japanese lacquer technique known as Urushi, by Urushi grand master Minori Koizumi of Yamada Heiando Company. The varnish used in this ancestral art of lacquering comes from the sap of the Urushi tree, in which the resin is harvested once a year in extremely small quantities, and can only be used three to five years afterwards. The highly resistant, honey-textured lacquer applied in extremely fine successive layers are put together to create the scene of a golden pig with a protruding stomach, (a symbol of abundance and joviality), appearing against a multi-coloured forest background – an exceptionally refined creation driven by an ultra-thin L.U.C movement: Calibre 96.17-L, limited to 88 pieces. Another timepiece by Chopard that celebrates the traditional Chinese culture by renewing its longstanding dedication to perpetuating artistic crafts is the one-of-a-kind Chopard L.U.C Perpetual T Spirit of the Chinese Zodiac. All the animals of the Chinese zodiac are depicted on the ethical 18-carat rose gold case, achieved using the champlevé engraving technique, an art that calls for meticulous patience in order to hollow out tiny cavities in a subtle play on volutes and light effects; more than 210 hours are put in to bringing the 12 symbolic animals of the Chinese calendar to life on the gold case: the tiger’s head appears on the crown, while its body follows the curve of the case middle, and the space between the lugs is adorned with a dragon and a snake. Since 2009, Panerai has been honouring the fascinating tradition of the Chinese Zodiac upon the Luminor Sealand – 44mm model, with superb engravings carried out by hand by Italian master craftsmen. The Panerai Luminor Sealand – 44mm Year of the Pig is the 11th model for the special timepiece series, with only 88 pieces produced. 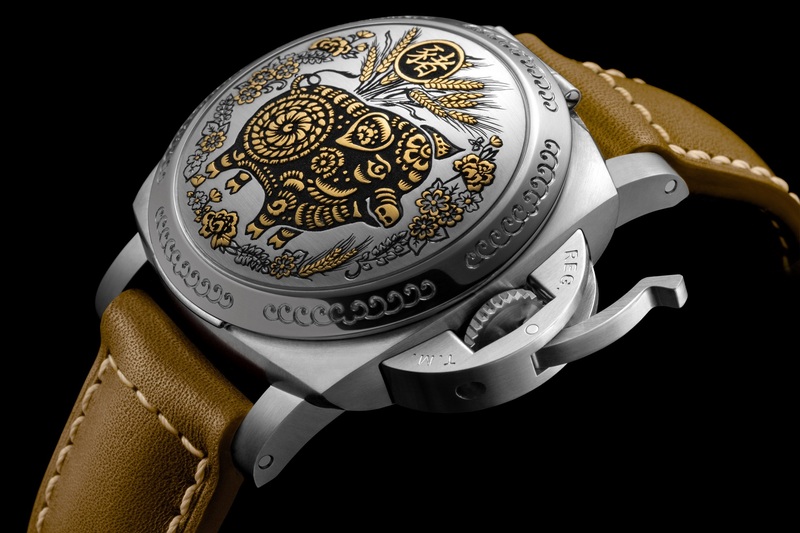 The cover of the new special edition is engraved with the image of the Pig surrounded by typical floral decoration chosen for its auspicious significance, using the ancient technique of “sparsello”, executed with the greatest skill in a style inspired by traditional Chinese iconography. So named after the special tool used to decorate the cover, first grooves are made in the steel before they are inlaid with gold threads in multiple parallel layers. These are then beaten until they completely fill the grooves which together form the outlines of the Pig and the sophisticated decoration.